Now that it's officially "Fall", with Labor Day over, kids back in school and nothin' but 100 degree temps in sight, I humbly invite you back to the garden this Saturday, Sept.7th at 9am to transform one of the raised beds to a WICKING BED. What's a wicking bed, you might ask? Well as of two weeks ago, I had no idea either, until I went to a Transfarming meet-up at my new friend Arturo's house, where he lead a class on aquaponics and introduced us to all sorts of alternative growing methods, one of which, was wicking beds. A wicking bed is essentially a raised bed that is extremely efficient at keeping it's plants hydrated and holding in vital nutrients in the soil which otherwise get washed away. I have noticed over the past 3 years (yes, it's really been three years!) of intense gardening in our 3- 4'x12' beds, that no matter how much we "love" our soil in the form of composting, fertilizing and planting nitrogen-rich cover crops--the beds are just plain tired and the production and yield of vegetables and fruits is way down. So I'm thinking we try an experiment and remove all the old, tired soil out of one of the beds, install a waterproof bed liner and PVC subterranean watering system and fill it in with fresh loads of compost and soil and see what happens this fall. I know at minimum, we'll be saving a ton of water and hopefully seeing a major uptick on the fall crop production. Hope you can bring a shovel and join me Saturday on another adventure in the great garden experiment! This is a wicking bed. Notice the PVC pipe that creates a subterranean watering system. Arturo says he waters ONCE EVERY 3 WEEKS!!!! Compare this front bed to the one in the back that is a standard raised bed. 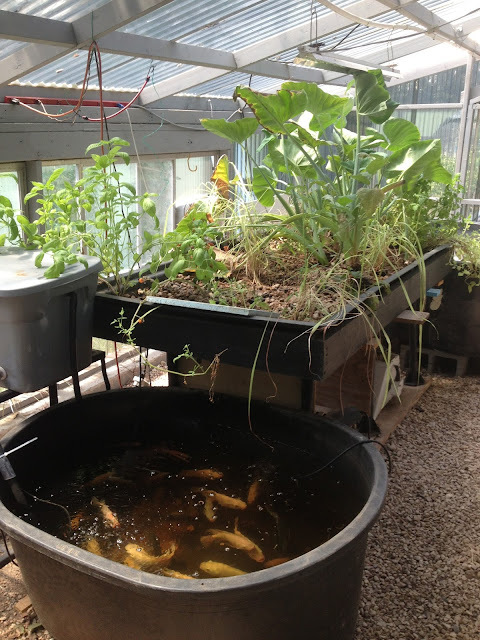 This is Arturo's super cool greenhouse aquaponics set up. I plan on trying this at home! Buy bedding online from Australia’s best online bedding store, Cotton Affairs, direct from the manufacturer. Cotton Affairs is Australia’s leading retailer of bedding, bath and dining products. Our bedding collection includes a wide range of bedlinen, quilts, quilt covers, sheets, doonas, duvet covers, blankets, bedspreads, pillowcases and more! We can provide you the best online shopping experience. Our selection ranges from the most luxurious Egyptian cotton bed sheets right though to practical quilt and doona covers. All available online for a great price!